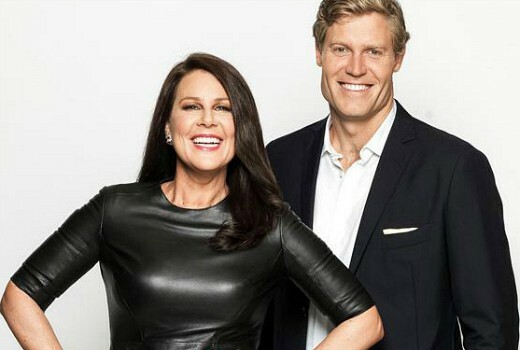 EXCLUSIVE: TEN is planning a new variety show for Julia Morris & Chris Brown. Industry sources tell TV Tonight TEN will mount a local version of the big budget Saturday Night Takeaway, one of the UK’s top-rating shows hosted by Ant & Dec. The network has recently been hinting at shiny floor shows on the way…. The studio-audience show includes musical numbers, hidden camera pranks and prize giveaways, including a Win the Ads game where audience members win products featured in the commercial breaks. If successful it could be the answer to viewers’ long-held calls for genuine variety back on TV, in a landscape crowded with Reality shows. The ITV Studios title was previously-announced by Seven for 2016 as Sunday Night Takeaway but did not proceed, amid chatter it was hoping to secure Hamish & Andy. But the chemistry between the multi-talented Morris and Brown, first paired together at a Logies event, has opened the door for TEN. The network is yet to confirm if the expensive I’m A Celebrity Get Me Out of Here will return. Saturday Night Takeaway has already seen international versions in Portugal, Finland, China, Germany, France and the US with Neil Patrick Harris. OMG not this pair of no hopers again. 10 need to get more than half a dozen celebrities on their books. We are tired of Brown, Morris, Keller, Denyer, Bailey etc. being on every possible show. Please more variety. Sounds like a good idea. About time there was a late night variety show in Australia. And I love Chris and Julia as hosts. I really hope TEN brings back I’m A Celebrity Get Me Out Of Here. Good news. Hopefully this means IACGMOOH is banished and they put this on only for the 1 night a week at a time when everyone is asleep. Cannot stand these two. Julia tries too hard to be funny and Chris is like a deer in headlights. He should stick to being a Vet. Yeah that would be awesome. Australia’s got talent….. Julia can have another go st it on Ten with Chris ! Love variety shows, providing it gets actual air time. Not sure it’ll rate great on Saturday, probably suited for Mondays. Because you can never get to much of a good thing…. will be better than the excuse they call “I’m a celebrity(?) Get me out of here…. although wasn’t channel 7 working on this? I thought I’m a celeb was already returning next year? Well I hope so anyway. But Chris, my dog needs his nails cut. When can you squeeze him in ? Suspect it will be Sunday Night Takeaway, unclear. It’s a shame if it’s not Saturday night as there’s never anything decent to watch on Friday & Saturday. It would also have a better chance by not directly competing with 2 other reality shows on 7 and 9, which I’m sure will happen. Good variety shows are lacking today. Probably good time to redo Big Brother and Aussie Idol. Both have life if they stay true to the original show. I love these two, that would be a great show. But I still hope I’m a celebrity comes back. This sounds like a genuinely good idea. I hope it makes it to air and succeeds. Do you know David if Ten are intending to put a big budget show on Saturday night or would they call it something else like just ‘Takeaway’ and air it on another night?